The repair of random cracks and application of a coating in a secondary containment area was a major concern at this airplane manufacturing plant. Due to the limited shutdown time and low October temperatures, most conventional coating systems were ruled out. 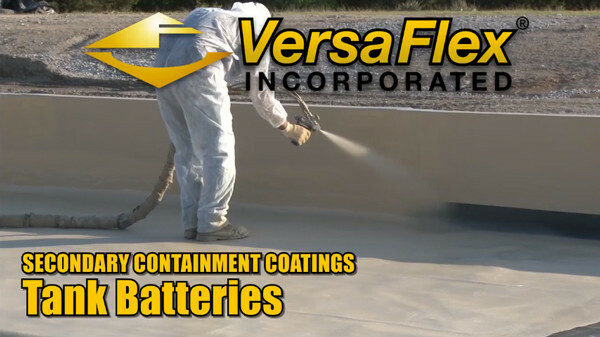 VersaFlex rapid curing polyurea coatings and sealants were specified and successfully installed. The random cracks were ground out and filled with SL/75, which took less than 1 hour to cure. Aqualok concrete sealer and primer was then installed to insure proper bonding of the protective coating to the substrate. Finally, FSS-45DC polyurea spray, with a 5-second gel time, was applied at a film thickness of 65 mils. The entire project was completed from start to finish in just 4 days, which was half the time it would have taken using a conventional coating system.